I'm a seasoned cruiser but I had to overcome new challenges when I took my daughter on her first cruise. I didn't have a suite but wanted to create suite like features of a suite that would make life with a toddler at sea more enjoyable. By planning ahead and speaking with the crew I want to share what works for me when cruising with a small kid. Showers on cruise ships are notoriously small. I could have sucked it up and forced my toddler to swap her bath routine for a shower but I opted to find a solution. 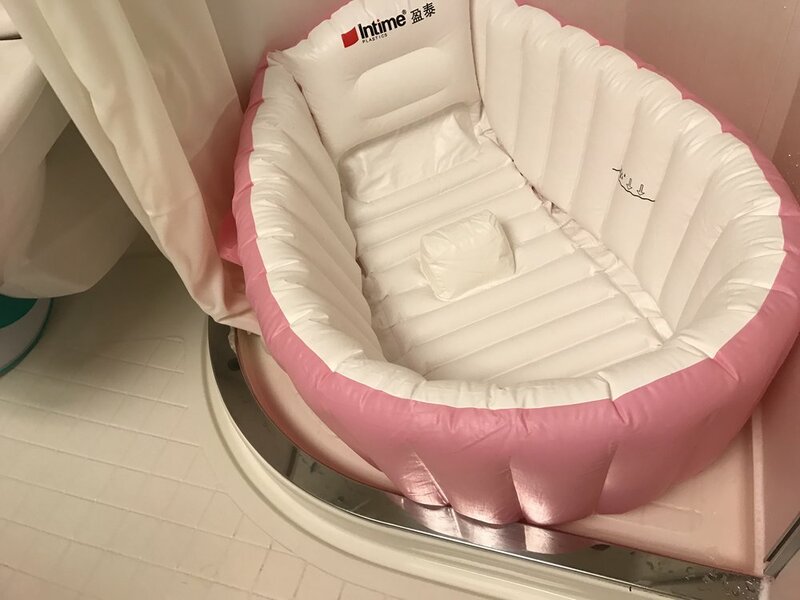 This inflatable tub fit snugly into the shower and allowed me to relax while my daughter frolicked and played in the bath like she is accustomed to. Our small ocean view statement lacked a separate sitting area. If my daughter was napping, I wanted to be able to watch tv or read a book without disturbing her. I attached magnetic hooks to the ceiling and hung a fabric shower curtain. The shower curtain was the prefect space divider. The magnetic hooks can be purchased on Amazon. If you're not planning to indulge on the overpriced goodies in your mini bar, ask your stateroom attendant to empty it. Then you'll have a functioing refrgirator in your room that can store milk, yougurt, and other snacks that your kids may need. Yes, there is always food available on a cruise ship but it's convientn to have cold water, milk, and other necesties available imedietly. In Tip #2 I mentioned that I used magnetic hooks on the ceiling. You can hang other stuff from the walls too! Hooks for wet towels and bathing suits, white booards, cubbies, anyhting that makes life easier on board. 5. Your room can be rearranged. If you don't like the way your room is arranged, it can be changed. Of course your limited do to the small size of a standard cabin but if changing where the beds, sofa, and tables will meet your familiy's unique needs the staff is willing to do it for you.